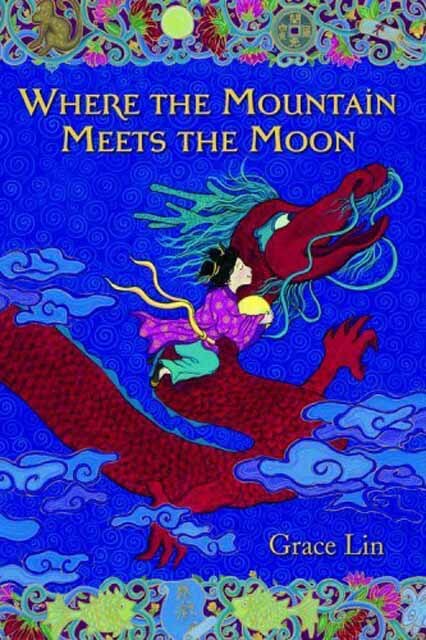 Win A Copy Of Grace Lin's "Where The Mountain Meets The Moon"
March is National Reading Month. ChinaSprout is celebrating by giving you free shipping on all book purchases through March 20th. We are also giving away a copy of Grace Lin's book, "Where The Mountain Meets The Moon." Grace is one of my favorite authors for young children. Her simple and colorful illustrations remind me of Chinese folk paintings. Plus, her stories really capture what it is like to grow up Asian in a Western country. ChinaSprout was fortunate enough to work with Grace on our "One Year In Beijing" book. Her beautiful illustrations take me back to many of my own experiences growing up in Beijing -- the excitement of Lantern Festival, visiting Yellow Mountain, eating delicious candied haws, families gathering for the holidays and studying very hard in school. Post your favorite Grace Lin book title on Twitter (you must include @ChinaSprout in your post). You can enter up to three times -- one entry for each platform (our blog, our Facebook Page and via Twitter). Entries will be accepted starting at midnight, March 14 and the deadline for entry is midnight, March 21, 2011. The entries will be catalogued by entry date and time, and the winner will be chosen via a random number generator software program. The winner will be chosen within 2 days of the entry date deadline. The winner must respond within 5 days of receiving notice, or the entry will be forfeited, and another winner will be selected. You must live in the United States or Canada and be 18+ to enter. Read the Official Giveaway Rules for further guidelines. Adoptive parents in trans-racial families have additional challenges to parenting biological children. In addition to the usual childhood struggles, we must find ways to support and guide our children through issues involving not only adoption, but race, as well. Helping my children to identify themselves as Chinese was something that I believed I was doing pretty well. We discuss our children's heritage and culture regularly. It is a deeply ingrained part of our lives. We are active members of Families With Children From China. We attend Jane Brown lectures and playshops. We have watched and discussed "Adopted the Movie" together numerous times. And, over the years, we have engaged in any number of activities and conversations in an effort to promote racial awareness within our girls. Imagine my surprise when my precocious 8 year old asked me how our neighbors knew that she was Chinese after they dropped off some Chinese New Year decorations that they had purchased in Singapore. Confused, I pursued this question with her a little more, and come to find out, she visually identifies herself with her Caucasian brunette friend. My personal lesson here is that no matter how well-adjusted you think your kids are, think again. Living in Los Angeles, our friends came from extremely diverse backgrounds and the girls' school could be called 'a little United Nations.' Since moving to the Midwest, and more specifically the suburban Midwest, that diversity is harder to come by. While our youngest daughter is Chinese, and her best friend is African American, she is evidently still self-identifying as white. No matter how much we love our kids, and no matter how hard we try to introduce them to their culture, the reality is that my husband and I are white, and that cultural color rubs off on our girls. In fact, it is undeniably their primary make-up. We often laugh together about nature vs. nurture moments with our girls. However, those nurture traits are what point up the difference between being raised white and being raised Chinese. There is nothing that I can do to give my transracially adopted children the direct experience of being raised Chinese. It is an ability unique to Chinese parents. I've been eyeing Outsiders Within and the Pieces of Me workbook for the girls, and now they take special priority. My Mind on Paper - This blog is written by Kevin Hofmann, an African American man adopted by white parents in the 1960s. He now lectures on the subject of transracial adoption. His posts are thoughtful and insightful. As evidenced by his most recent post where he recalls a childhood relationship, his learning on the subject is on-going. Ethnically Incorrect Daughter - Blogger Sumeia Williams offers sometimes heartbreaking stories on her struggles to self-identify, a theme which is not uncommon in transracial adoption circles. Do you believe that race or cultural identification is important? If so, what are you doing to help your children learn about their cultural heritage and ultimately embrace who they are?